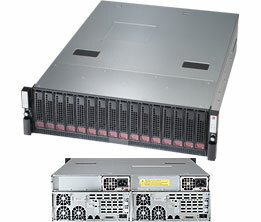 3U SuperStorage 6037B-DE2R16L for network infrastructure, front-end enterprise, and minimal-downtime cluster server systems. Note: This product will be sold as a complete system (integrated with CPU, memory & drives as a standard configuration). Please contact sales rep for special requirements. Monitors for CPU Cores, +1.5V, +3.3V, +5V, +12V, +3.3V Standby, +5V Standby, VBAT, Memory, Voltages.